The multi-talented R Madhavan is one of the few Indian actors who has achieved nation-wide appeal with his versatile performances in multiple languages. His sessions talk about his journey in Bollywood and the lessons he has learned along the way, providing his audience with new perspectives on dealing with challenges through creative problem solving. Madhavan is known to be an actor that can fit into any role and make it his own. He began his career with television appearances including one of the lead roles in the prime-time series “Banegi Apni Baat” that received a lot of praise from the audiences. His most recent foray into a web-based thriller-drama series on Amazon Prime ‘Breathe’ has fast become a fan favourite with its clever plot and stellar performances. 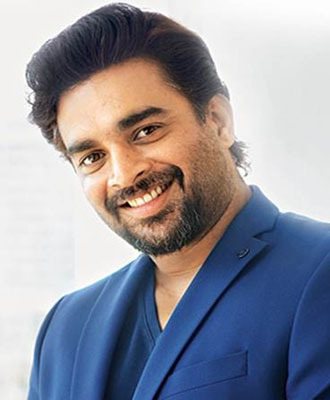 In addition to his acting career, Madhavan has worked as a writer on his films, hosted television programmes and has been a prominent celebrity endorser for brands and products. He is involved in several social causes around environment, health and education. Particularly vocal about the protection of animals, he was awarded PETA’s Person of the Year recognition in 2012. Madhavan is a Harvard and International Public Speaker and is a big proponent of innovative thinking, having a solution mindset and being current in your approach. The audience leaves his sessions knowing a little more about their favourite actor but also armed with practical takeaways on how to tackle problems and forge a?head. ? He is an avid golfer, biker and a great skier too.